The exon junction complex (EJC) is a central effector of the fate of mRNAs, linking nuclear processing to mRNA transport, translation and surveillance. However, little is known about its transcriptome-wide targets. We used cross-linking and immunoprecipitation methods coupled to high-throughput sequencing (CLIP-seq) in human cells to identify the binding sites of the DEAD-box helicase eIF4AIII, an EJC core component. 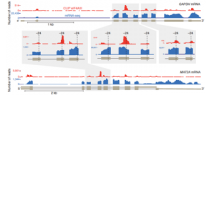 CLIP reads form peaks that are located mainly in spliced mRNAs. Most expressed exons harbor peaks either in the canonical EJC region, located 24 nucleotides upstream of exonic junctions, or in other noncanonical regions. Notably, both of these types of peaks are preferentially associated with unstructured and purine-rich sequences containing the motif GAAGA, which is a potential binding site for EJC-associated factors. Therefore, EJC positions vary spatially and quantitatively between exons. This transcriptome-wide mapping of human eIF4AIII reveals unanticipated aspects of the EJC and broadens its potential impact on post-transcriptional regulation.